The first welfare state in the Americas. The first to field black players in international tournaments. The first South American champions, and the first world champions. They hosted the first World Cup. They invented the vuelta olimpica (the victory lap). They invented futsal. They were the first to recognize the Armenian genocide, the first to provide every primary school student with a laptop, the first to nationalize the marijuana industry. Uruguayans are desperate to claim responsibility for almost anything. Forever overshadowed by its giant neighbours, Uruguay takes pride in its history. It seems that every accomplishment is further proof that the country deserves to exist. While the world expands, Uruguay shrinks. As such, these achievements are evoked at almost every opportunity. Uruguayans obsess with the past in order to feel relevant today. This post will concern Uruguay’s claim to tango legend Carlos Gardel. Macho but loyal, successful yet vulnerable, Gardel’s image and voice catapulted him to the top of the world. He was a magician. Most accept that he was born in Toulouse, France. Uruguayans claim that he was born in Tacuarembó, Uruguay. Not in dispute, however, was his extraordinary talent and influence on Argentina’s national identity. 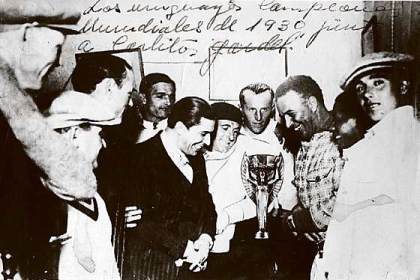 Having attained Argentine citizenship five years earlier, Gardel decided to accompany his adopted national team to the Amsterdam Olympics in 1928. In the lead up to the tournament decider against Uruguay, Gardel met with the Argentine delegation in their hotel. There he performed an emotional rendition of the tango ‘Dandy’. Days later, the Argentines were defeated by Uruguay, who became world champions for the second time. Two years later, the first World Cup was staged in Uruguay. Few Europeans made the journey. Once again, Uruguay and Argentina were to meet in the final. Once again, Gardel decided to pay the Argentines a visit prior to the decider. Led by the tournament’s top scorer and Gardel’s friend, Guillermo Stábile, the delegation begged the star to sing for them. Once again, he sang ‘Dandy’. Once again, Argentina was defeated. There could be hardly any doubt. Gardel was Uruguayan. The ’28 and ’30 finals intensified what was an already fierce rivalry. Argentina had celebrated Uruguay’s 1924 Olympic triumph as a win for the dominant rioplatense style of play. Six years later, such solidarity had disappeared, never to be recovered. Seeking to calm tensions years later, Gardel invited both squads to a special concert in Paris. It ended in violence, a hallmark of future games between the two. Every contest, at any level, there is a score to settle. Argentina seeks revenge for past humiliations, including its inability to win a title on the soil of its former province. Uruguay has won three titles in Argentina. For Uruguayans, every contest is a chance to silence what they see as a historically patronizing neighbour. It is yet another reason for them to exist. Indeed, football results only scratch the surface of this rivalry. When they meet, it is usually ugly. What remains beautiful is the voice of Gardel, whose magic is preserved through his premature and tragic end in Medellín. Gardel died on top of the world. He died Uruguayan. And that kid looking right into the camera (right) is none other than Obdulio Varela!